This could leave you and your clients servers as risk of having outdated backups. If your using DigitalOceans weekly backups you could be 7 days out of date when recovery! Does DigitalOcean Support Daily Backups? DigitalOcean current backup offering only allows weekly backup of droplets and there is no support for backing up volumes. 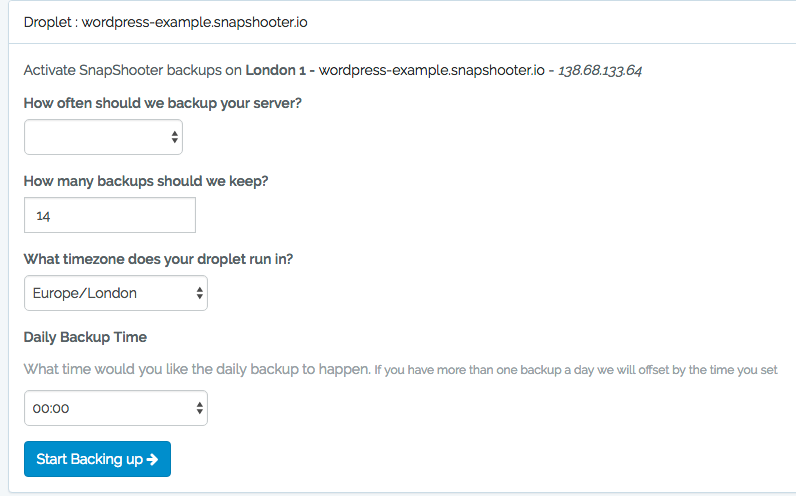 This is where SnapShooter steps in, we build a service that allows customers to backup DigitalOcean Servers from hourly to daily. Unlike DigitalOcean we also offer support for daily volume backups. DigitalOcean call there snapshots crash-consistent backups meaning the system captures all data on the disk in exactly the state it was at a single point of time (requested snapshot time), meaning your data will be in a consistent state. You do have to remember it only backup data writes to disk at the time, any pending disk writes in memory for example will not be included. The host machine makes a SnapShot of the guest VM (your droplet) using the copy-on-write implementation, once completed the snapshot is sat on the Host machine and transferred to off server storage within DigitalOcean data-center. The copying off the host machine can be the slowest part depending on how busy your Host machine is and current loads. What regions can you make DigitalOcean Snapshots? You can make backups of your droplets in any DigitalOcean region, see out supported DigitalOcean regions to see full support, including region snapshot transfer support.